Wooden heels on your shoes can bring a look that other styles just can't achieve. They can make high heels look more casual, allowing you to wear them with a beach-themed or outdoorsy outfit. On the other hand, they can bring a note of solid earthiness to an otherwise fancy or dressy outfit. Wood heels scuff easily. If the shoe soles are dark rubber, you can quickly end up with dark streaks all over the wood from the times one foot brushed the other. These unsightly marks can destroy the visual impact of your shoes, making them look sloppy. If you wear your shoes regularly, you can also accumulate dirt or dust on the heels. 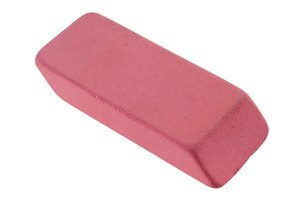 Rub the mark on the heel briskly and firmly with an eraser. Brush off the eraser remnants and look carefully at the smudge. If it is fainter, keep using the eraser on it. This alone may be enough to remove the smudge. Dip a sponge into a mixture of warm water and dish soap. Wring out the sponge to leave it damp rather than dripping wet. Ideally, you should use a sponge that is soft on one side and rough on the other. Wipe the wood heel with the soft side of the sponge. This should remove any dirt, dust or grime that has built up on the wood. Scrub any hard-to-remove dirt with the rough side of the sponge. Be gentle; scrubbing too hard could scratch the wood or the varnish covering it. You can also do this on dark scuff marks if the eraser did not get rid of them. Wipe the scrubbed heel one more time with the soft side of the damp sponge. Dry it with a clean towel or rag.